this tour is a guide to the basic sites of communist rule in east-berlin. on this tour of a defunct dictatorship you will encounter not only the various "memorials for socialists" celebrated by the regime and the building where its infamous state security service was headquartered, but also the massive concrete grounds of alexanderplatz and the bohemian neighborhood of prenzlauer berg. after the popular uprising of june 17, 1953, only soviet tanks were able to save the communist regime. 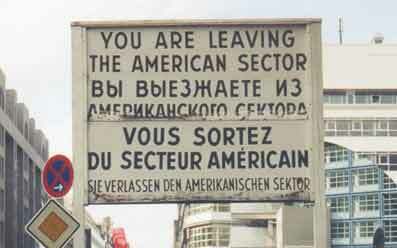 people began to flee the east german state as soon as it was founded in 1949. only construction of the berlin wall in 1961 was able to stem this hemorrhage of refugees. between 1949 and 1989 there were approximately 250,000 political prisoners in the german democratic republic (gdr). originally conceived by its founders as the homeland of an "anti-fascist germany," the gdr remained little more than a dictatorship until its demise. although the majority of the population had given up on any hope of changing the situation after the popular uprising of 1953 was suppressed and the wall was built in 1961, the ruling elite in east berlin did not entirely succeed in extinguishing the spirit of freedom. until its final day the gdr experienced diverse acts of resistance on a broad scale. whoever wishes to learn more about this history with should sign up for the basic tour of east berlin offered by unwrapping history. meeting place and length of tour: the meeting place for this tour is the entrance to the friedrichsfelde central cemetery (zentralfriedhof friedrichsfelde) on gudrunstrasse, near the lichtenberg rapid transit (s-bahn) station. the tour lasts approximately 2 1/2 hours. prices and booking: your pay 15 euros per person and tour. simply book by e-mail and you will immediately receive a message in reply. for this tour you will also need a local public transportation ticket. you may buy this from the tour guide for 2.10 euros.